What To Expect When New Ideas Are Introduced In The Church. What do you expect when new ideas are newly introduced into the church? When it come to mission, there are new ideas and innovative ways in which God is leading. Not everyone is on board with the new ideas. In fact, very few people may be on board with them. We may be tempted to become discouraged, thinking that the new, innovated idea is flop, not knowing what is normal. We may prematurely give up without knowing that God is about to launch and great and wonderful Gospel work in your ministry. Sometimes it takes years for a Gospel work to move from one category to the next. The first people to catch the vision and hear the call, are the innovators. They are willing to embrace an idea, without any infrastructure in place. They will be the first ones to embrace the mission. They will plant the seeds and lay the groundwork for future Gospel workers. They are the ones who don’t let go of the vision. They keep the congregation informed. As we can see 0% to 2.5% of the people of the congregation can be innovators. In a congregation of 130 people, that means that if you have 4 to 5 people embracing and new calling in the church, then that is normal. That is a healthy number. Never get discouraged. Keep planting seeds and laying the foundation work, if that is the will of God. Give it a couple of years to move to the next stage. The following is a business article that explains the graph from a business sense. It is very applicable to the work of God. —- Kevin E. Jesmer 2-15-15. The innovation adoption lifecycle is an understanding of the acceptance and growth of a new product or service within a market. It breaks down the stages based on the type of individuals likely to receive the item. Understanding this cycle will allow you to target specific users of the community you’re building to maximize your growth efforts. Starting a business in the affiliate marketing industry has very few restrictions. A good idea, focus, and leveraging resources allow anyone to get a start. However, whether or not the market will adopt your offers is the real difficulty. The following will explain the various points of the innovation adoption lifecycle and apply it to fresh affiliate marketing businesses. It will share suggestions for each phase of the journey. These are the individuals that immediately understand the value. This is the point where you’re likely to be approached by investors. Likewise, you will begin to build a small, passionate community around your brand because they’re ready to be a part of the next big thing. The early adopters are some of the first to get wind of what’s happening in the market. They’re the techy type that wants to explore what you have to offer. They may not all stick around but their patronage will become the bridge into gaining a higher market share. You’re now making a mark in the market. The individuals in this group are well educated enough to see the value in what you have to offer and whether to jump ship from what’s already out there. Adoption will be slightly slow at this point since it’s dependent on how aggressive you are at marketing and making business contacts. You’re now at the tipping point. This is where you have to push through the barriers discovered along the process. Your market share is at around 50% which means you’re well-known within the community but it still needs a few more nudges to become commonplace. These individuals will hop on board after all the kinks have been fixed. They’re the ones that find the offer through word-of-mouth and the feeling that they’re missing out. They know it’s out there but they haven’t had the chance to try what you have to offer but if they did they’re bound to become part of the community. These are the individuals that fail to see the value in what you have to offer. They’re often held back based on “traditions”, lack of education, or a vision. There’s not much to say other than the fact that they’re tedious to handle and please. 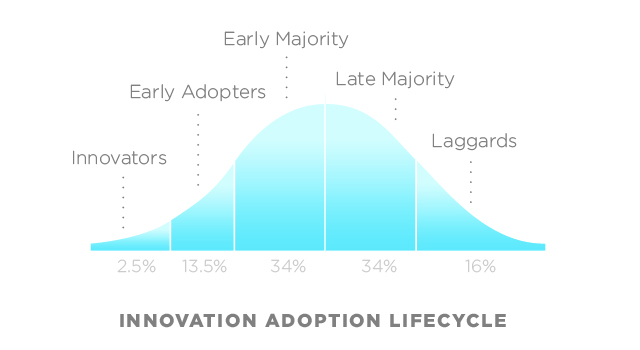 Understanding the innovation adoption lifecycle gives you the insight as to which areas of your business (and its community) require the most commitment. Identifying those early adopters will kick start buzz and growth. Entry into the early majority will grant you the capital to increase value in the business and fund the marketing efforts needed to push past the tipping point. Assimilation is inevitable once you crack the late majority. Laggards are a pure hassle but at least you’ll know you’ve made it. What part of the lifecycle does your business stand? « 2-14-15. The Real St Valentine- A priest in Rome who was brutally executed.